That statement took me by surprise. Not to say that actual images are not collectible—but a lot of what he said is true. Which is why you should run, not walk—to your computer and consider buying this book “In Situ: American Folk Art in Place.” It is written by noted folk art collector and scholar Jim Linderman and it will someday be considered a rare book. This book shows Jim’s longtime private collection of the most unusual, curious and beautiful American folk art in location—as it was made long ago. Many pieces have long since vanished, in fact most were never meant to last but a short time. Sometimes the best in situ folk art environments were made spontaneously and with great inspiration. Others took years to make, the product of careful planning and hard work. Jim is a Grammy-nominated artist and photos from his collection were used to produce the well-known Take Me to the Water: Immersion Baptism in Vintage Music and Photography 1890-1950 release. This is the third book of photographs in the Dull Tool Dim Bulb series. More information on the author is available at his incredible Web site www.dulltooldimbulb.com and on his many other art, culture and photography sites. 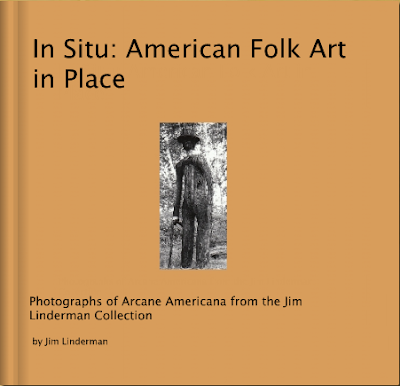 “In Situ: American Folk Art in Place” is a 112-page book available both in hardcover, with jacket, and softcover. In fact, by going to his site you can see the book and click on the image to buy it. Your book will be delivered in a couple of weeks if not sooner. Many of the photographs are real photo postcards which are over 100 years old and have never been seen before. This is a major collection being shown and shared together for the first time.